Being left-handed can be tough. About 90 percent of Americans are right-handed, and as a result, most products are manufactured with right-handed people in mind. Scissors, computer mice, and other things that people use on a daily basis are better suited for those who use their right hands than those who use their left hands. And even when things are made for lefties, they can be hard to find in certain instances. That’s not necessarily the case with left-handed fishing equipment. There are quite a few left-handed baitcasting reels out there, and believe it or not, there are actually many right-handed fishermen who prefer using them. One of them is none other than Patrick Pierce, a professional fisherman who takes part in Bass Pro Shops Bassmaster Opens. Pierce prefers using left-handed baitcasting reels even though he is right-handed. Is it because left-handed people have a decided advantage when they fish with the equipment made specifically for them? Not necessarily. Pierce has talked about how he uses a left-handed baitcasting reel because it allows him to be more efficient. With a left-handed reel, he can cast out with his right hand and then keep the reel there while reeling with his left hand. It frees his right hand up to control his bait, set his hooks, and fight fish when he feels a bite rather than relying on his weaker hand to do it. Therefore, it’s not that lefties have better equipment than righties or anything; it’s that righties can, in Pierce’s opinion at least, utilize left-handed equipment to their advantage better than they can right-handed equipment. 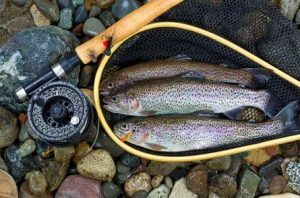 No matter which hand you use when you fish, Signature Fishing Rods can provide you with custom fishing rods that will allow you to bring in more fish. Just take a look at all of the products we have in stock right now. Contact us at 630-530-8775 today to place an order or ask any questions you might have about our rods.